TWU Stakes Claim for BikeShare Workers;; First in NYC, Then Chicago and Boston | Godwin, Morris, Laurenzi & Bloomfield, P.C. By Godwin, Morris, Laurenzi & Bloomfield, P.C. of Godwin, Morris, Laurenzi & Bloomfield, P.C. on Friday, January 29, 2016. In a brand new industry, this union is starting off on the right foot. Bikeshare mechanics, drivers, and dispatchers have already gotten some practice confronting managers on the job. Photo: TWU Local 100. Say you've just won union recognition, in an organizing drive led by rank and filers. Now you're facing a new set of tasks: bargaining a contract, learning to enforce it, and linking your workplace up to the bigger union you've joined. How do you keep the momentum rolling, so that the day-to-day culture of your new union is as bottom-up as your "vote-yes" campaign was? Six hundred newly organized workers are tackling these challenges at four of the largest bikeshare systems in North America. Workers recently ratified first contracts in New York City, Washington, D.C., and Boston. Chicago is the latest to reach a tentative agreement. And on January 8, bikeshare workers in a fifth location, Jersey City, voted to unionize. Bikeshare is a new type of transportation where riders borrow a bike in one place and return it in another. The first U.S. system hit D.C. five years ago. Today at least 80 municipalities have or are planning to install systems. About 10 companies are developing bikeshare in the U.S. The largest is Motivate, which operates the four systems where workers organized. Who makes bikeshare's wheels turn? Mechanics repair the bikes. Station technicians maintain the stations where bikes are docked. Van drivers transport the bikes between stations. Dispatchers assign routes for trucks. Field mechanics do minor repairs on the streets. And valets handle busy stations. 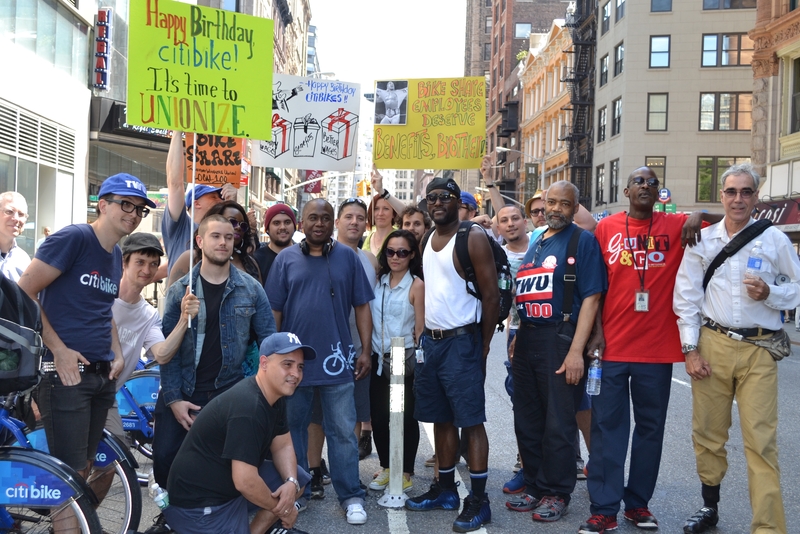 Workers at Citibike in New York City were the first to join the union. One of the big complaints was favoritism in layoffs and scheduling. The industry has a seasonal ebb and flow. When work slowed down for the winter, full-timers might have their hours cut back to two or three days a week. When the busy season picked up again, their old hours would be given away to new hires. "You got to keep a full schedule if you were friends with the manager, not if you were a good worker," said station technician Dave Kellman, now a shop steward. "One week I would be working mornings, the next week I would be working evenings, and the next week I'd be working overnights," said dispatcher Dolly Winter, also now a steward. "It happened across all departments," said driver Edwin Aviles. "They kept promising us raises, they'd promise they'd bring us back full-time, and then six months would pass, and they'd tell us we're still waiting. Everybody was just fed up." Wages ranged from $11 to $16 an hour, and working conditions were dirty and unsafe. Workers fixed bikes outdoors under one of the city's busiest bridges with no toilets or warming sheds, dodged a continual river of pigeon droppings, and suffered the deafening roar of subway trains every two minutes. Workers were also frustrated that they were expected to bear the brunt of Citibike's early financial difficulties--especially after they stumbled across a management spreadsheet. "The straw that broke the camel's back," said Kellman, "is when I saw that my boss was making four times as much as me. They were saying that they were laying people off because they didn't have enough money, but meanwhile they were maintaining managers who weren't really doing anything." How are bikeshare workers keeping in touch between Boston, Chicago, D.C., and New York? During bargaining, members held regularconference calls, and the Local 100 communications department producedwritten updates. Bargaining demands caught on from one city to another. In December Local 100 held its second annual Bikeshare Conference, bringing together members from all the represented cities for a weekend oftrainings and workshops. The conference coincided with the local's annual general membership meeting, which they also attended. To communicate and share strategies, bikeshare workers have set up a nationalemail listserv. A national newsletter is in the works. The bikeshare workers did all the early organizing themselves. Only after they'd talked extensively about forming a union did they contact Transport Workers (TWU) Local 100--a union mostly made up of 42,000 bus and subway workers at the New York City Transit Authority. Within three months of the Citibike workers' winning union recognition in New York, their counterparts in D.C., Boston, and Chicago had also joined TWU--and met together to start what they all hope will become a national union of bikeshare workers. TWU is getting in on the ground floor, organizing in an industry that didn't exist a decade ago. Feeding off the success in New York, TWU's organizer pushed the workers in each city to take control of their own organizing. They ran their own meetings and led the drive to sign up their co-workers on union cards. In each city, they organized marches on local management to demand union recognition. Only in New York did the company agree to recognize the union without an election--but in all four cities, this collective action worked to bring people together. The workers in Chicago, D.C., and Boston went on to win recognition votes. So what happened next? Rather than step in as a representation machine to whisk problems away into closed-door meetings, the union staffer has continued in the role of facilitator and trainer. Workers in each city elected a bargaining committee and surveyed their co-workers about what to fight for. They also elected stewards at each location, on each shift. They've formed a robust national network of 50 stewards, bargaining committee members, and shop floor activists. Although each city bargained separately, the workers developed shared national priorities. Taking some cues from their counterparts in traditional public transit, members entered negotiations wanting better wages, strong safety language, and seniority-based scheduling. Members didn't wait for a contract, though. They started tackling problems on the job right away with petitions and marches. Among the most successful was a concerted effort by bike mechanics in New York to get fair scheduling. Management had proposed unworkable schedules for the mechanics to pick from, where everyone would be forced to work a weekend day. The mechanics felt that weekend work wasn't necessary, and that schedules should be picked by seniority. They wrote up a protest petition, developed and pushed for alternatives, and boycotted the picking procedure until they got a more livable schedule. Workers in each city built a system to communicate progress at the negotiating table. They set up member-to-member networks, email listservs, and Facebook pages, and held regular meetings in the shops with bargaining committee members. They activated phone trees when important updates needed to get out. Bargaining sessions were open to all members--a policy that helped crank up the pressure on management. In New York, workers often packed the sessions to demonstrate that they were paying attention. As the contract fights shifted into high gear, workers leafleted the public at busy locations in Boston and D.C. In New York they even set a strike deadline, threatening to walk out if the company didn't agree on the size of the economic package by Memorial Day; the summer tourist season is when bikeshare workers have the most leverage. The company blinked. The new contracts include seniority-based scheduling, significant wage increases, eight weeks' paid maternity or paternity leave, and safety language that allows them to refuse unsafe work. In New York, the workers who once spent all day working outdoors in the cold now spend only short stints in those conditions, and have access to a heated warm-up room when they're there. But even with contracts in hand, the bikeshare workers are still using their shop floor power. New York mechanics recently put the brakes on a new policy that would have required everyone to take their breaks at the same time, 11 a.m.
"We confronted the manager directly and said that this policy needs to be bargained with the union, and that we needed to have a meeting about it," said mechanic and shop steward Briton Malcolmson. "Everyone saw it was dealt with not by grieving the contract, which is slower, but by confronting management." Joe Demanuelle-Hall and Nicholas Bedell are union representatives for the bikeshare workers at TWU Local 100. Meet bikeshare workers and thousands of others at the 2016 Labor Notes Conference, April 1-3 in Chicago. A version of this article appeared in Labor Notes #443, February 2016. Don't miss an issue, subscribe today.